Bald Head Island Golf Club, located only 45 minutes from North Myrtle Beach accross the border in North Carolina, offers a golf experience that is very unique for your Myrtle Beach golf package. Bald Head Island Golf Club is a private golf course that is accessible only by a passenger-boat or ferry. The golf course itself was originally designed by George Cobb and it was recently renovated by Tim Cate. 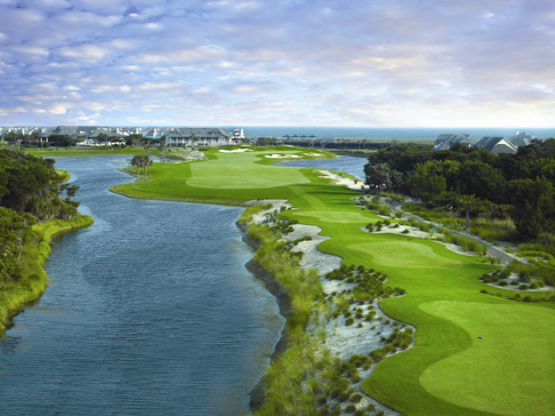 The course is situated on 35-acres that winds its way over dunes, around lagoons, along the ocean and through a maritime forest. Featuring new MiniVerde greens and deviously placed bunkers, this course offers a great challenge and will test even the expert players with a slope rating of 143 and a course raring of 73.7. Golf is only a part of the experience at Bald Head Golf Club. Traveling by ferry, outstanding scenery and the relaxed atmosphere is something that one will never forget. When booking your next Myrtle Beach golf trip you should give careful consideration to Bald Head Island Golf Club. We can include this outstanding Myrtle Beach golf course along with any others that you wish to make sure your next Myrtle Beach golf package will be an experience of a lifetime.